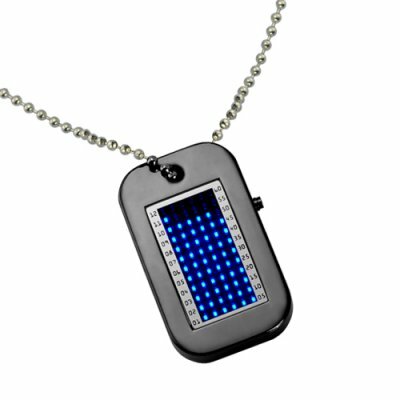 Successfully Added Terran Strike Dog Tag LED Watch to your Shopping Cart. Terran Strike Dog Tag LED Watch - Once used just for identification by the military, this LED watch is now a fashionable and handy timepiece worn around the neck. You mean this watch really tells the time? Yes! Press the button on the right side and watch as the screen comes to life with a bright blue LED light, cryptically and mysteriously displaying the time and date! Rookies won't be able to decode the enigmatic array of lights, but for a veteran like yourself, it takes just one glance to inform the perplexed onlookers: "It's 1:37, noob!". It's not just the inside that's impressive though, the thick metal frame of the Terran Strike Dog Tag LED Watch gives off an aura of substance and quality that just screams "BOSS". Wear it proudly and wear it confidently because nothing will put a dent on this durable LED watch, made from only the finest materials to ensure a lifetime of wear and tear. The Terran Strike Dog Tag LED Watch is the newest concept of trendy LED watches and one of the finest examples of art meets technology. Stock your online store with this unique watch to lock in some amazing profits! Brought to you by the leader in cool gadgets and LED watches direct from China, Chinavasion. Choosing a perfect gift just got a lot easier! Press the top button to display the time on demand. Press it again to display the date.